Macarons anyone? In my second instalment of Paris food adventures, I bring you Paris’ famous macaron house Laduree, located right in the heart of the Avenue de Champs Elysee. After some not so extensive Googling, I came across Laduree’s incredible website and decided to add it to my list of stops. Step through the elegant green and gold doors and you’ll find yourself in a dimly lit room with an amazing ambiance and, as you would expect the smells inside were divine. 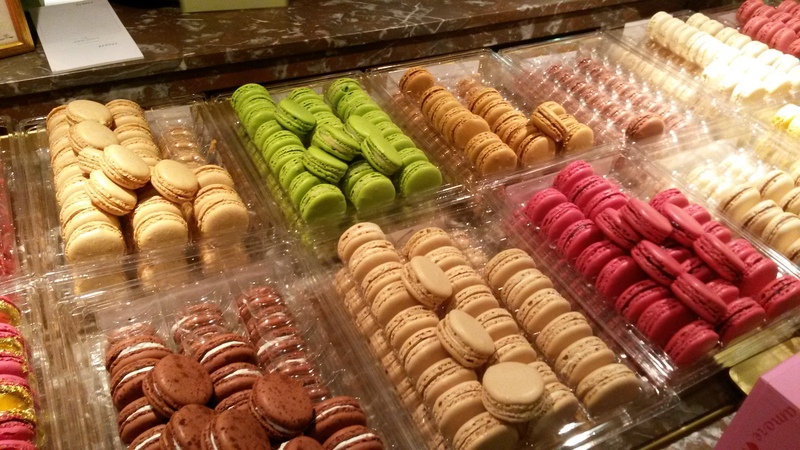 The left side of the shop is dedicated to selecting macarons and pastries. The right side, a cosy restaurant with luxurious patterned wallpaper and lamp lit tables. The décor both inside and outside was superb. The interior was full of lush green carpets and pretty tiles. Soft lighting and delicate lighting fixtures hanging from the walls and ceilings really compliment the produce on display which was the undoubted star of the show. 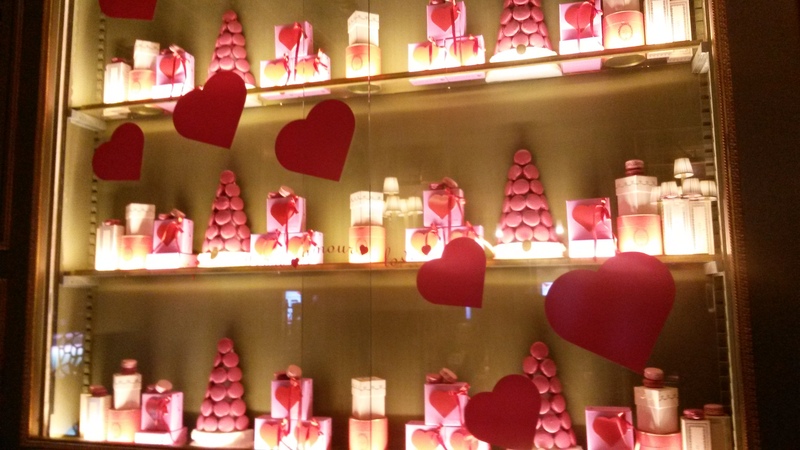 My trip was during the end of January so the windows were all geared towards Valentine’s Day. Nina Ricci had collaborated with the company to design a pink and gold covered strawberry macaron. These were on display in the shop window and for sale inside at the counter. The packaging for this was beautiful red Nina Ricci heart box or rounded box, which ever you preferred, costing €55 upwards. Definitely a present for someone who appreciates their macarons! 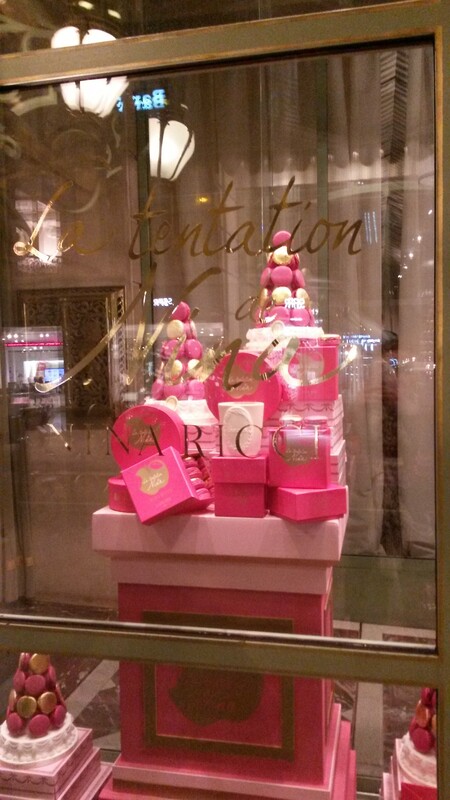 After randomly stumbling upon Piere Herme another famous macaron house in Paris, I was glad I waited for Laduree. 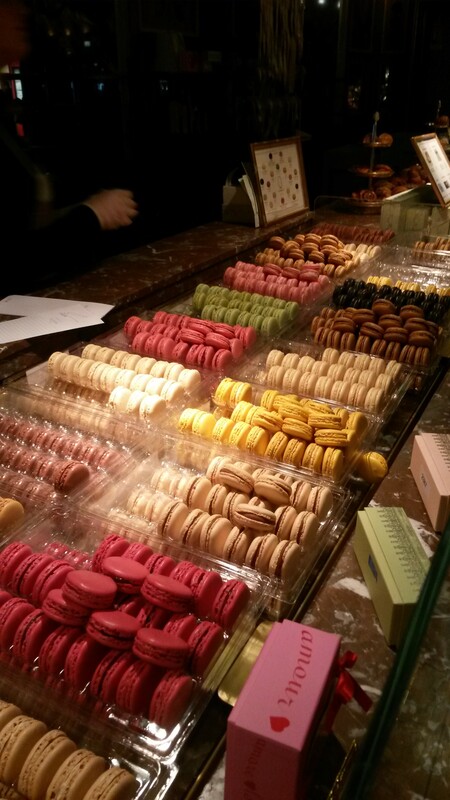 While the produce in Piere Herme looked lovely, Laduree was an unforgettable experience. The customer service was excellent. 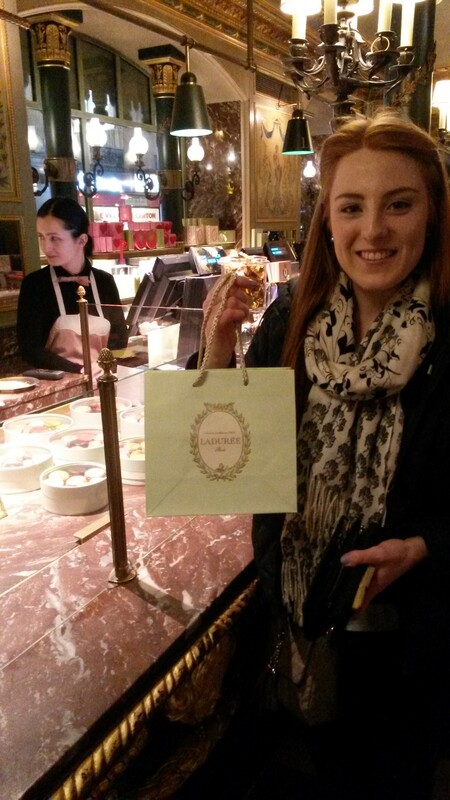 The Laduree staff members were extremely friendly, helpful and professional. Not having a clue which macarons I wanted to try, my server described a selection of his favourites and the more random flavours like orange blossom, “like something my grandmother would make me eat at her house.” I forgot to make a note of the 6 flavours I ordered, I know raspberry, chocolate and even the orange blossom were in the mix somewhere. They taste as good as they look! Price wise, it cost €15.80 for 6 mini macarons. Crazy as some might think that is, the customer service was incredible and the product even more so. The packaging was amazing and you got to choose from three different boxes. I went for the traditional green but there were other options available. 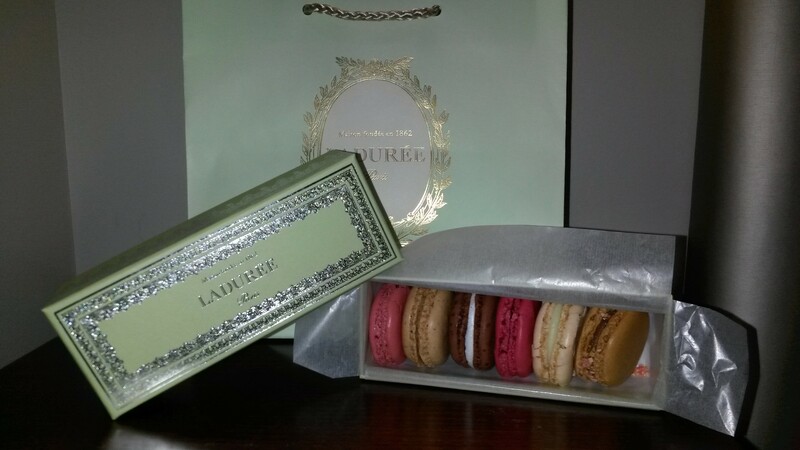 Laduree is a must for any foodies out there or lovers of luxury macarons! Let me know if you have been or plan to go to Laduree. Click here to see my post on Dinner at Le Schmuck Paris. 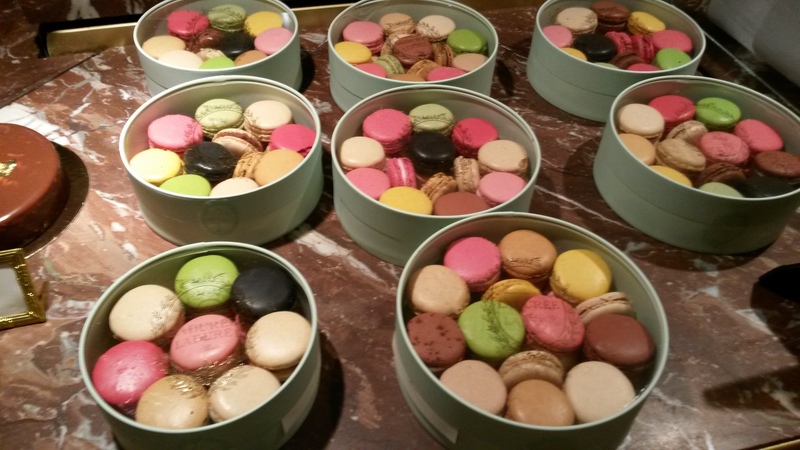 This entry was posted in Lifestyle Posts and tagged Champs Elysee, Food, food review, french food, Laduree, Laduree Paris, Macarons, Nina Ricci, paris, review. Bookmark the permalink.